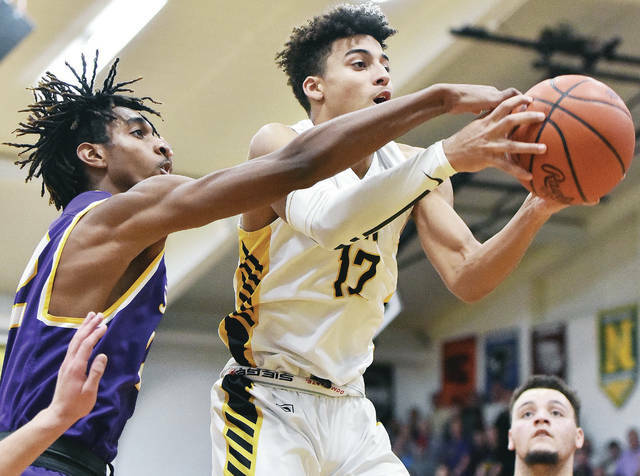 Sidney’s Darren Taborn shoots while covered by Vandalia-Butler’s Ryan Wertz and Quentin Glover during a Greater Western Ohio Conference American North Division game on Tuesday in Sidney. Sidney’s Andre Gordon shoots as Vandalia-Butler’s Ryan Wertz defends during a Greater Western Ohio Conference American North Division game on Tuesday in Sidney. Sidney’s Ratez Roberts shoots as Vandalia Butler’s Quentin Glover defends during a Greater Western Ohio Conference American North Division game on Tuesday in Sidney. 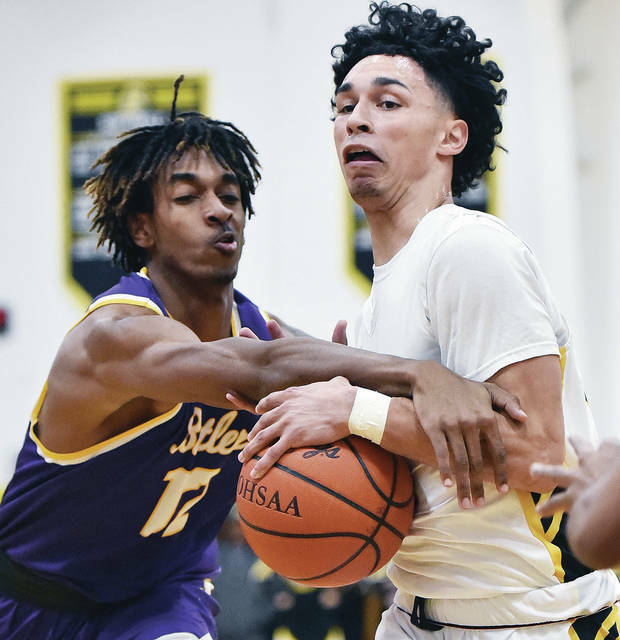 Sidney's Andre Gordon drives as Vandalia-Butler's Bryant Johnson defends during a Greater Western Ohio Conference American North Division game on Tuesday in Sidney. Sidney's Dominick Durr shoots as Vandalia-Butler's Braedon Norman defends during a Greater Western Ohio Conference American North Division game on Tuesday in Sidney. 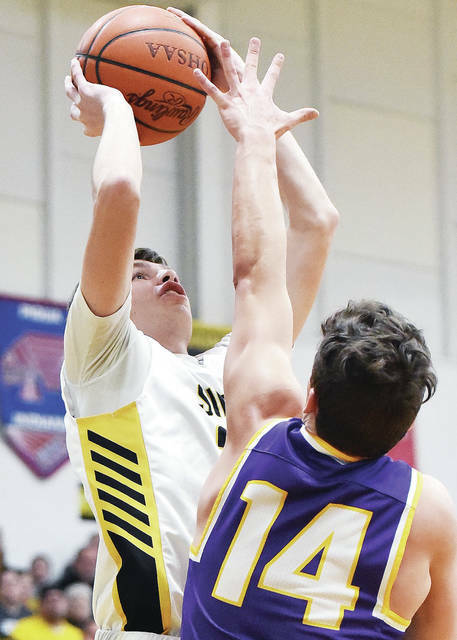 Sidney's Trey Werntz shoots as Vandalia-Butler's Ryan Wertz defends during a Greater Western Ohio Conference American North Division game on Tuesday in Sidney. Sidney's Ratez Roberts drives as Vandalia's Tyler Montague defends during a Greater Western Ohio Conference American North Division game on Tuesday in Sidney. Sidney's Keith Lee and Vandalia Butler's Bryant Johnson reach for the rebound during a Greater Western Ohio Conference American North Division game on Tuesday in Sidney. Sidney's Ratez Roberts shoots as Vandalia-Butler's Matt Beverly defends during a Greater Western Ohio Conference American North Division game on Tuesday in Sidney. 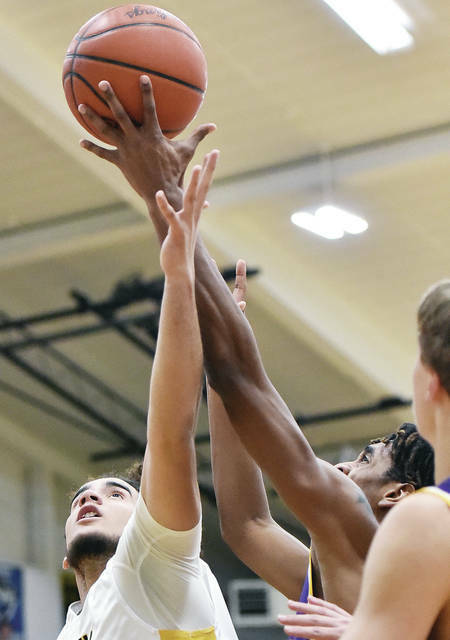 Sidney's Lathan Jones shoots as Vandalia-Butler's Bryant Johnson defends during a Greater Western Ohio Conference American North Division game on Tuesday in Sidney. View more photos from Butler at Sidney here. 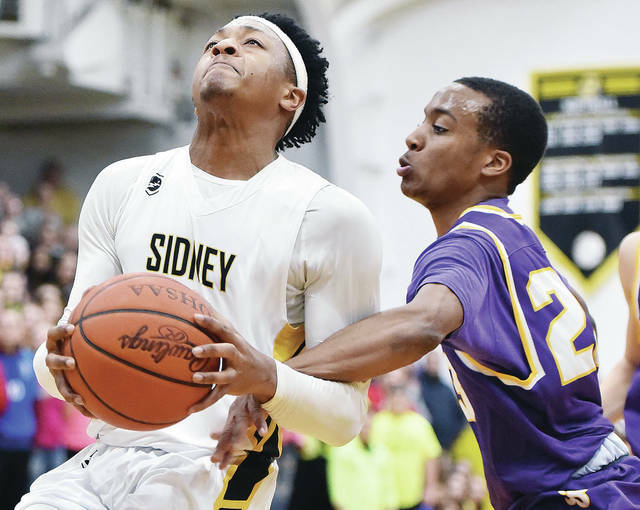 SIDNEY — Bad play at the start and finish of the de-facto Greater Western Ohio Conference American North Division championship game hurt Sidney’s chances of earning a third consecutive conference title. Vandalia-Butler scored 10 of the last 12 points to run away and earn a 47-41 victory in front of a sellout crowd. 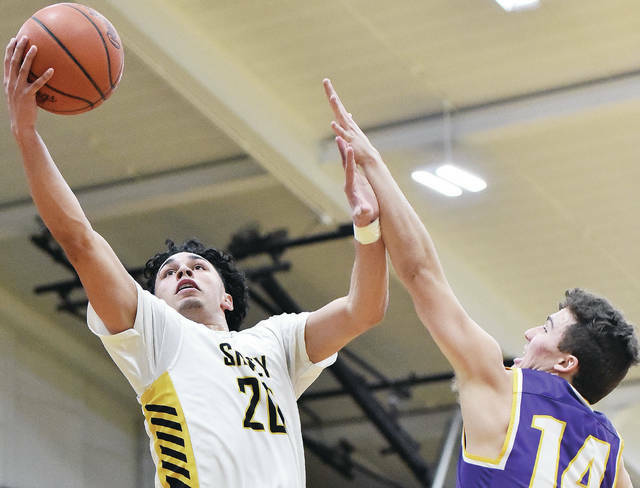 Sidney (17-4, 11-3) will have to beat winless Greenville on Friday and hope Tippecanoe can upset the Aviators (19-2, 12-2) in order to secure a share of a third consecutive conference title. The win secures a share of a second consecutive title for Butler. 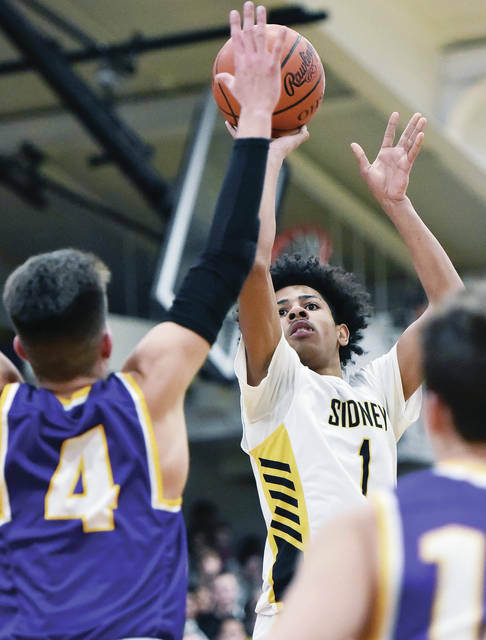 Keith Lee made a basket for Sidney to end a 10-0 Butler run as time expired. It was the Yellow Jackets’ first in over six minutes. It was of two scoreless streaks that Lee broke in the game. Sidney didn’t make a field goal for the first eight minutes. “It probably won’t hit until about three o’clock this morning,” Sidney coach John Willoughby said. “We missed a lot of shots. I don’t know what our shooting percentage was, but we’re usually in the high percent of two-point field goals, usually around high 50’s. We missed a lot of them today. Butler led 34-32 at the end of the third, but Lathan Jones made a layup after a steal 11 seconds into the fourth to tie it up. The teams traded points until the Aviators’ decisive run. Andre Gordon hit a reverse layup to put Sidney ahead 39-37 with 6:06 left. After a quiet and fast three minutes, Bryant Johnson made two free throws with 3:00 left to tie it. Ryan Wertz made a 3 from the left wing to give Butler a 42-39 lead, then Sidney missed two shots on its next possession. Quentin Glover made a free throw with 51 seconds left to push the lead to four points. 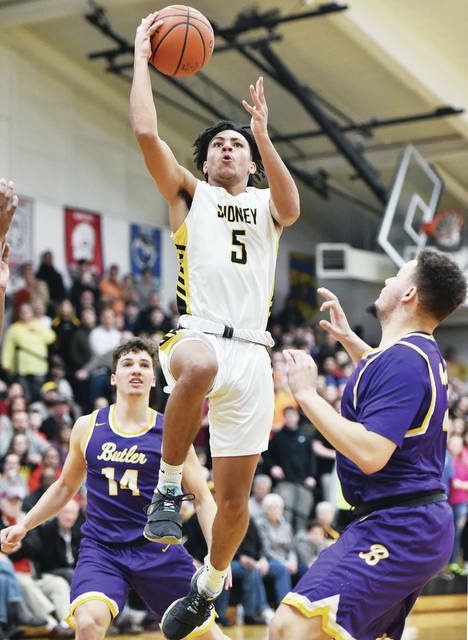 After Sidney missed a shot on its next possession, Butler came away with the rebound and Sidney was forced to foul Johnson with 21 seconds left. Johnson made two free throws to push the advantage to 45-39, and Tyler Montague added a layup after a Sidney miss with about eight seconds left to seal the win. It was an odd first half, as Butler scored the first 15 points of the game only to see Sidney scored the next 16 and take the lead. The Yellow Jackets led 22-21 at halftime and took a 29-24 lead midway through the third after two baskets by Gordon, but two free throws by Cooper Justice and a long 3-pointer by Braedon Norman tied it up with 3:09 left. Norman nailed another 3 with 2:12 left to put Butler up 32-30, but Gordon made a basket with 1:40 left to tie it 32-32. Norman made a basket in the paint with 30 seconds left to put Butler ahead by two points at the end of the quarter. Norman led Butler with 18 points. Wertz finished with nine for Butler while Glover added eight. The Aviators played with leading scorer Michael Kreill sitting on the bench for the second consecutive game. Gordon led Sidney with 16 while Ratez Roberts finished with 10, all in the first half. Wertz scored four of the game’s first eight points, with Glover and Johnson adding baskets in the paint in-between. Norman hit a 3-pointer from the left wing with 4:21 left, which prompted Willoughby to call a timeout. Wertz made a basket with 2:54 left, then Norman made a basket after a Sidney turnover to push Butler’s advantage to 15-0 with 1:48 left and cause Willoughby to call another timeout. Gordon made a pair of free throws with 1:00 left in the first to finally get the Yellow Jackets on the scoreboard, and Lee made the team’s first field goal on a layup with 7:13 left in the second quarter to trim the deficit to 15-4. The Yellow Jackets’ big run continued. Gordon made a basket and Roberts made a three-point play after a goaltending call. Roberts and Gordon then each made two mid-range baskets, and Roberts made a bank-shot 3 with 4:23 left to give Sidney a 16-15 lead. The Yellow Jackets took a 22-19 lead after a pair of Roberts free throws, but Norman made a basket with one minute left to cut the gap to one point at halftime. “I’m glad we battled back, but I’m surprised how hyped we were early on,” Willoughby said. “Everything seemed extraordinarily fast for us. Trying to shoot the ball too quick, releasing too quick. …It took a lot out of us to (come back). 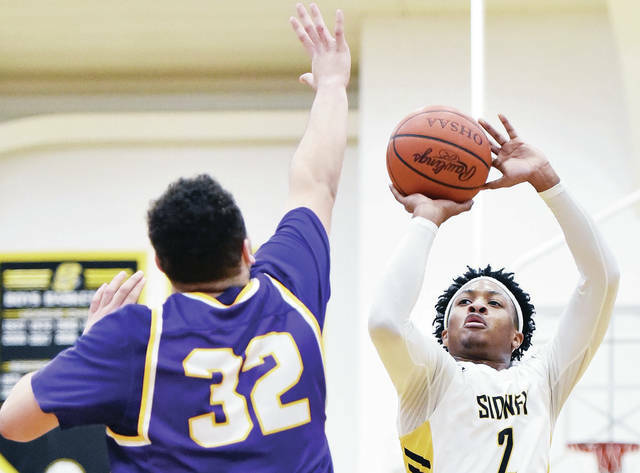 Sidney beat Butler in Vandalia in overtime on Dec. 18 but lost conference games to Fairborn and Trotwood-Madison in January and was tied with the Aviators heading into Tuesday’s contest. Butler’s only other league loss was to Trotwood. Sidney, the No. 4 seed in the Dayton Division I sectional, will open tournament play on Feb. 23 at Butler’s Student Activities Center. 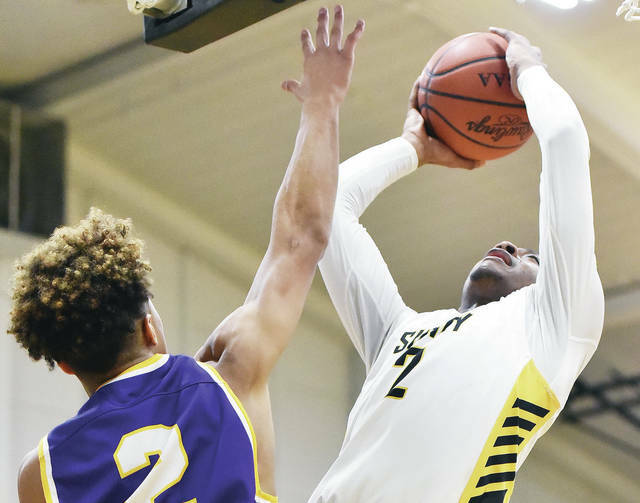 Sidney’s Andre Gordon drives as Vandalia-Butler’s Bryant Johnson defends during a Greater Western Ohio Conference American North Division game on Tuesday in Sidney. Sidney’s Dominick Durr shoots as Vandalia-Butler’s Braedon Norman defends during a Greater Western Ohio Conference American North Division game on Tuesday in Sidney. Sidney’s Trey Werntz shoots as Vandalia-Butler’s Ryan Wertz defends during a Greater Western Ohio Conference American North Division game on Tuesday in Sidney. Sidney’s Ratez Roberts drives as Vandalia’s Tyler Montague defends during a Greater Western Ohio Conference American North Division game on Tuesday in Sidney. Sidney’s Keith Lee and Vandalia Butler’s Bryant Johnson reach for the rebound during a Greater Western Ohio Conference American North Division game on Tuesday in Sidney. Sidney’s Ratez Roberts shoots as Vandalia-Butler’s Matt Beverly defends during a Greater Western Ohio Conference American North Division game on Tuesday in Sidney. Sidney’s Lathan Jones shoots as Vandalia-Butler’s Bryant Johnson defends during a Greater Western Ohio Conference American North Division game on Tuesday in Sidney. This entry was tagged American North, Andre Gordon, boys basketball, Bryant Johnson, Butler, championship, D-I, Darren Wyrick, Div. 1, Div. I, Division 1, Division I, DJ Wyrick, Greater Western Ohio Conference, GWOC, GWOC American North, GWOC North, high school, John Willoughby, North, ohio, photographs, photos, picture, pictures, Ratez Roberts, result, score, Sidney, statistics, stats, title, Tournament, Vandalia, Vandalia-Butler, who won, Yellow Jackets Aviators. Bookmark the permalink.